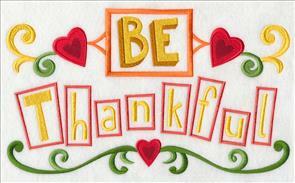 Celebrate blessings with designs of thanksgiving and gratitude! 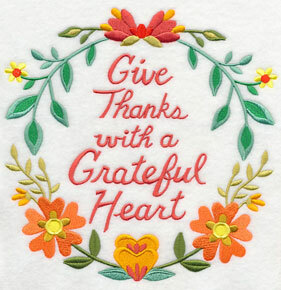 They're a perfect fit for the upcoming holiday, and excellent daily reminders for us to give thanks, always, with a grateful heart. 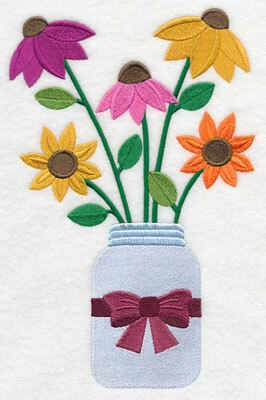 Circles and wreaths are bright and beautiful on tea towels, aprons, and table linens. Autumn flowers are lovely against elegant baroque backdrops. You'll see two distinct styles: contemporary and classic. 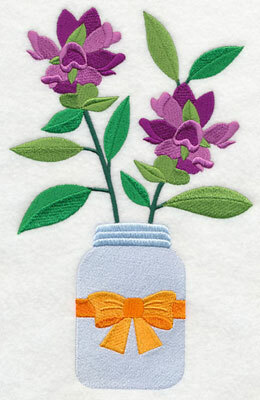 Primitive flowers in Mason jars bring a cozy look to cushions, quilts, and table runners. 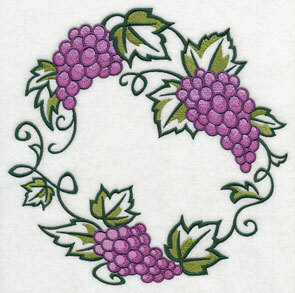 Circles grapes and wreaths of wheat bring a modern look to towels, aprons, and table linens. Scroll down the page to see these new designs! 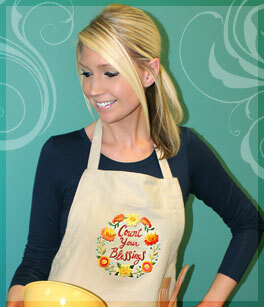 New designs bring a spirit of thanksgiving and gratitude to aprons and table linens! 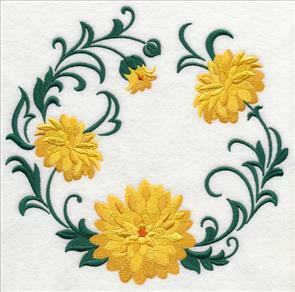 Circles and wreaths bring sweet symmetry to aprons, towels, and placemats. 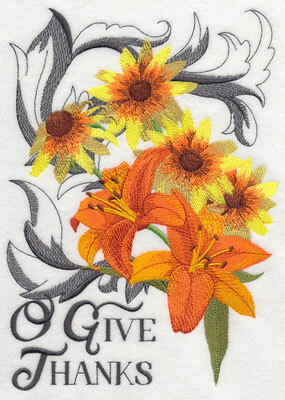 Warm-hearted phrases are framed by colorful fall flowers, adding a beautiful look to home decor. 7.80" x 7.50" and 7.18" x 6.90"
6.09" x 5.86" and 4.96" x 4.77"
7.80" x 7.76" and 6.95" x 6.91"
5.89" x 5.86" and 4.87" x 4.84"
Thanksgiving is a time when thoughts turn to family, friends, and the blessings that surround us. 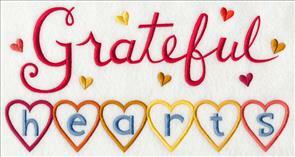 Stitch the spirit of thanks onto mini-quilts and wall hangings, and fill your home with these sentiments. 7.81" x 7.64" and 7.06" x 6.91"
7.81" x 7.70" and 7.00" x 6.90"
5.92" x 5.83" and 4.93" x 4.85"
Add these beautiful wreaths to table runners, wall quilts, and more! 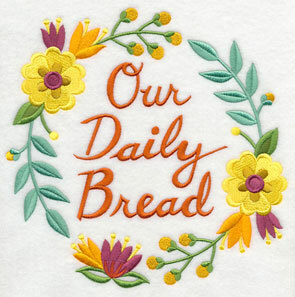 The "Our Daily Bread" design shown below is beautiful on tea towels for bread basket liners. 7.81" x 7.71" and 7.00" x 6.91"
5.94" x 5.86" and 4.91" x 4.85"
7.64" x 7.79" and 6.89" x 7.03"
5.86" x 5.98" and 4.87" x 4.96"
Beautiful sentiments, framed in stunning fall flowers, are a wonderful way to fill your home with a thanksgiving spirit. The designs can be ordered individually by using the links above, or get all six wreaths in a design pack! 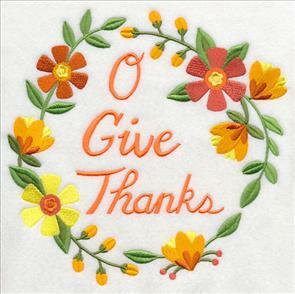 Elegant baroque swirls and filigree provides a glorious backdrop for autumn flowers and Thanksgiving greetings. Brighten up pillow covers and wall hangings with these designs! 6.90" x 9.83" and 5.47" x 7.80" and 4.81" x 6.85"
Chrysanthemums, stalks of wheat, and ripe grapes are classic elements of autumn. Bring fall's beauty and splendor to your home decor projects with these designs! They're stunning additions to linen table runners, canvas tote bags, and denim pillow covers. 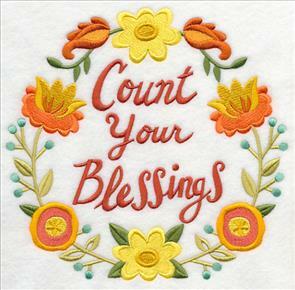 6.90" x 9.88" and 5.89" x 8.45"
6.90" x 9.96" and 5.85" x 8.44"
5.40" x 7.80" and 4.75" x 6.85"
Colorful and whimsical sentiments are a perfect fit on the bibs of aprons, placemats, and tea towels. 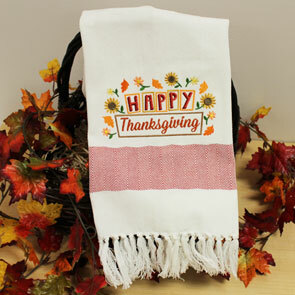 Stitch these sweet and charming motifs and bring the warm feeling of Thanksgiving to your kitchen and dining decor! 11.00" x 6.20" and 9.39" x 5.29"
7.80" x 4.40" and 6.83" x 3.85"
These new designs are beautiful additions to linen and tea towels. For tips and tricks, see this Fabrics 101 article! 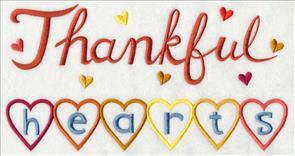 Messages of thankfulness are beautiful on placemats and pillows. We used bright autumn hues in these samples - but experiment with colors to find something that matches your decor and taste! 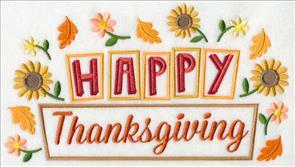 11.01" x 5.63" and 9.39" x 4.80"
11.01" x 6.50" and 9.39" x 5.54"
7.80" x 4.61" and 6.86" x 4.05"
Add messages of thankfulness and gratefulness to aprons, placemats, and tea towels. 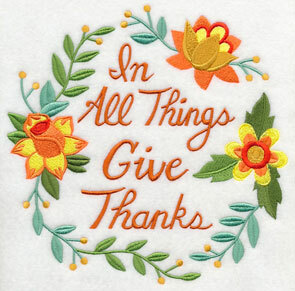 Dress your home for the holidays with the spirit of gratitude and thanksgiving. 11.01" x 5.75" and 9.39" x 4.90"
11.01" x 5.65" and 9.39" x 4.82"
7.82" x 4.01" and 6.86" x 3.52"
A message of "gather together" is paired with a heart, and swirling, stylish lines. 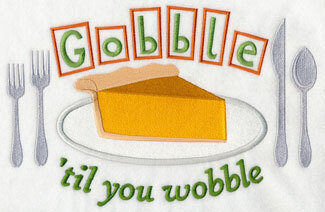 A colorful "turkey time" design features a pair of the gobblers. 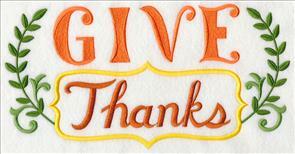 Both are wonderful ways to spice up your home for Thanksgiving! 11.01" x 6.04" and 9.39" x 5.16"
10.99" x 5.13" and 9.37" x 4.38"
7.80" x 3.65" and 6.85" x 3.20"
Both of these designs are fun additions to shirtfronts, aprons, and placemats. 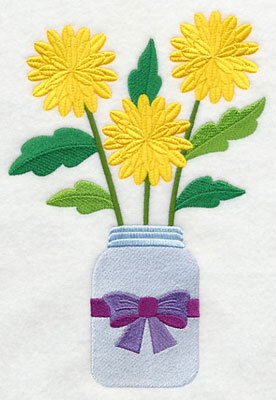 Or, stitch onto a linen towel, and turn into a wall hanging! 11.01" x 6.10" and 9.39" x 5.20"
10.57" x 6.88" and 9.00" x 5.86"
7.79" x 5.08" and 6.86" x 4.47"
Brightly-colored coneflowers blossom and bloom from a Mason jar. 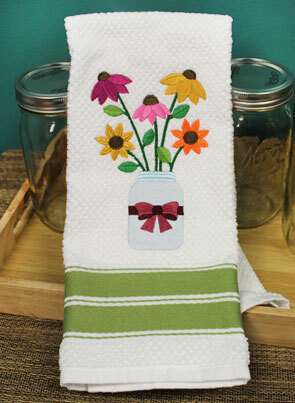 A sweet addition to kitchen decor - like this towel! And, it's a fun way to dress up table linens, like placemats and runners. A sure way to add a cozy, country look to your home. 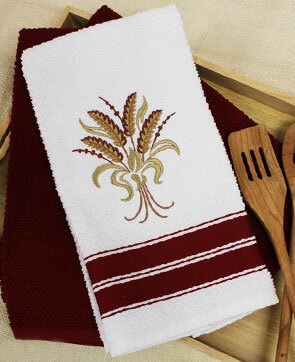 5.86" x 9.03" and 5.07" x 7.81"
4.45" x 6.86" and 2.51" x 3.86"
These designs are beautiful additions to kitchen towels. 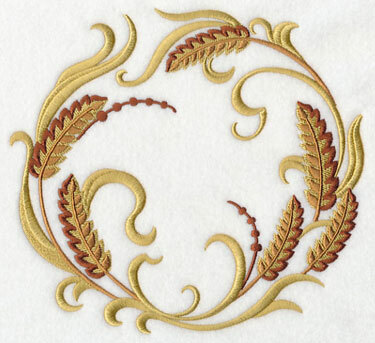 Use one piece of cutaway stabilizer as backing; when embroidering on terrycloth, use a topping. More tips and tricks are in this tutorial! 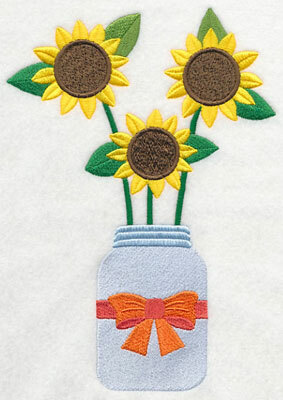 Sunflowers and daisies add a fresh look to jacket backs, table runners, and placemats! 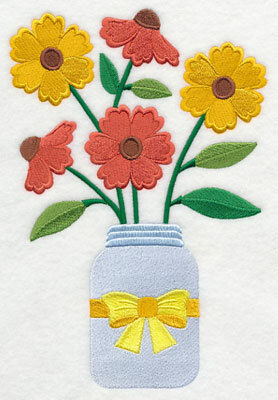 The simple lines and shapes bloom bright from Mason jars. 5.85" x 8.39" and 5.44" x 7.80"
5.77" x 8.29" and 5.43" x 7.80"
4.69" x 6.73" and 2.69" x 3.86"
Turtleheads and helenium are colorful additions to home decor. 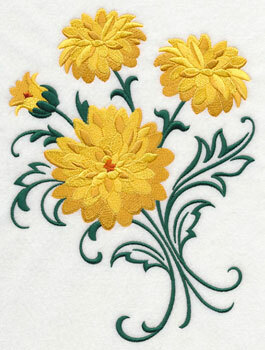 We embroidered the petals in traditional colors. 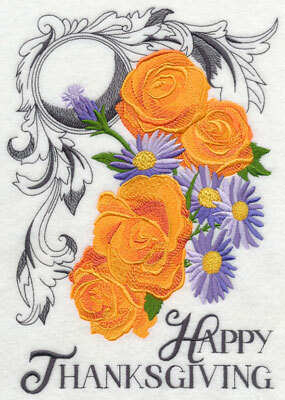 But one of the fantastic things about embroidery is that we can choose colors to match our personal preference and taste. Explore different combinations until you land on one that you love! 5.85" x 9.15" and 5.00" x 7.80"
5.86" x 8.62" and 5.31" x 7.80"
4.66" x 6.84" and 2.63" x 3.86"
A trio of chrysanthemums bloom in a Mason jar. Drawn in a primitive style, this design is a classic one, and ready to bring a traditional look to home decor. 5.86" x 8.61" and 5.30" x 7.80"
4.67" x 6.86" and 2.62" x 3.86"
Wheat has long been an iconic element in kitchen and dining decor. It symbolizes life, harvest, prosperity, and a connection with the earth. 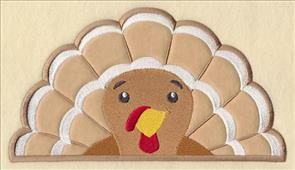 Wheat sheaves, wreaths, borders, and corners are simple ones, with few color changes. 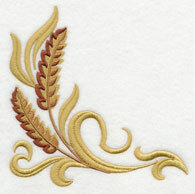 They're fast - but elegant - additions to your embroidery projects. 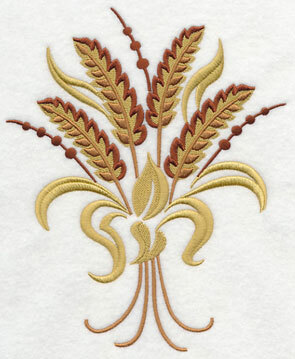 6.91" x 8.44" and 5.86" x 7.16" and 4.86" x 5.94"
Wheat is a classic accent for kitchen towels. 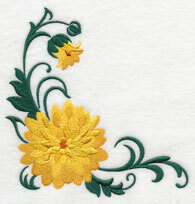 Get excellent results when embroidering on terrycloth towels by using the tips in this tutorial! A circle of wheat reflects a circle of harvest, and leaf. 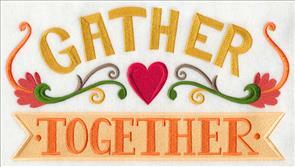 This design is stunning on a tote bag for the farmer's market, apron bibs, and linen towels. 7.49" x 6.91" and 6.35" x 5.87"
5.21" x 4.81" and 3.89" x 3.59"
Borders and corners of wheat are favorite additions to placemats, table runners, and linen napkins. 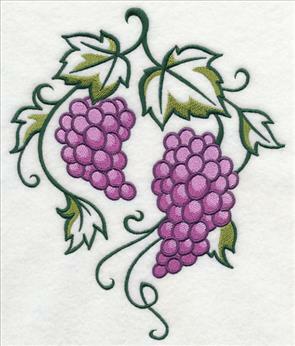 9.41" x 3.32" and 7.81" x 2.76"
6.00" x 2.35" and 3.86" x 1.57"
Add this classic motif to your kitchen and dining decor! Graceful circles, sprays, borders, and corners can be ordered singly by using the links above. Or, buy the designs in a pack! Click the links to see the designs included in each pack, as contents vary. 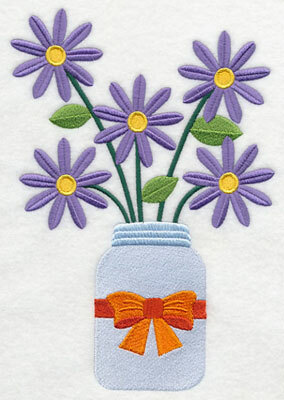 **XL - 8 designs smaller than 7" x 11.8"
**Lg - 8 designs smaller than 6" x 10"
Bring fall fashion to garments and home decor with wreaths and bouquets of chrysanthemums! They're bright and beautiful on the backs of denim jackets. 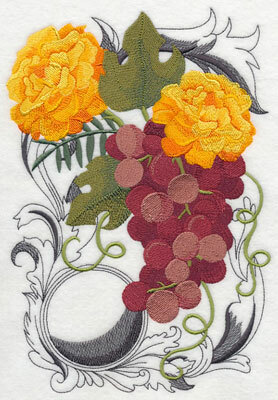 And, they'll add autumn elegance to tote bags, table linens, and wall hangings, too. 7.79" x 7.59" and 7.07" x 6.88"
5.97" x 5.82" and 4.99" x 4.86"
6.89" x 9.32" and 5.78" x 7.81" and 4.89" x 6.61"
Add a bright look to table linens, quilts, and towels! 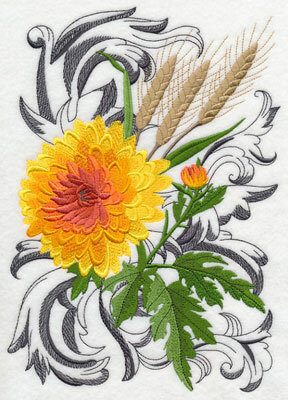 We embroidered the chrysanthemum in a traditional shades of gold. But let your creativity run wild with color palettes! Choose colors for the flowers that match your personal preference, and home decor. 5.81" x 5.81" and 4.84" x 4.84"
11.26" x 3.79" and 9.39" x 3.16"
7.80" x 2.63" and 6.00" x 2.16"
Autumn beauty will fill your home! Order the designs singly by using the links above. Or, buy them in a design pack! Contents vary, so click on a link to see the designs that are included in each pack. Grape bunches are graceful in circle and oval shapes. The purple and green contrasting colors are eye-catching additions to table linens, and tote bags! 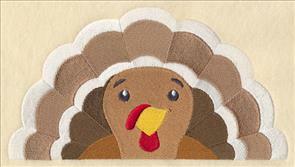 The leaves have some open areas, so choose smooth fabrics - linen, quilter's cotton, denim, duck cloth, etc. 7.79" x 7.65" and 7.02" x 6.89"
5.95" x 5.84" and 4.94" x 4.85"
6.89" x 8.17" and 5.83" x 6.91" and 4.86" x 5.76"
Corners are borders are a classic way to dress up table linens. Add the borders to placemats and table runners. Tuck the corner onto a linen napkin. The designs have open areas, so choose neutral, smooth fabrics. 5.84" x 5.85" and 4.84" x 4.85"
11.74" x 3.93" and 9.39" x 3.15"
7.79" x 2.61" and 5.98" x 2.24"
Artfully-designed grape bunches add a fresh look to kitchen decor. 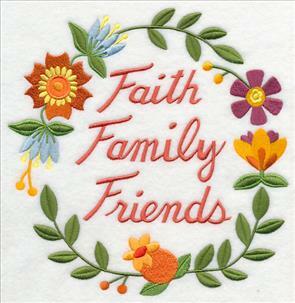 Add them to towels, aprons, and table linens! They're also a fantastic way to dress up gifts for wine-lovers. The designs shown above can be ordered singly, or in a design pack! Contents vary, so click on a link to see the designs that are included in each pack. 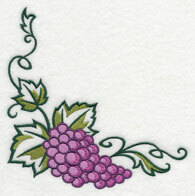 Theresa wrote to say that she loves the On the Edge designs, and has been using them to peek from the edges of towels. 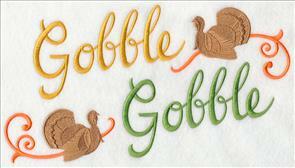 She was looking for a turkey to make Thanksgiving placemats (and I have a feeling that she'll dress up a bath towel set, too!). Your wish is our command! Below find two versions of an "on the edge" turkey. The left is stitch-filled, the right is applique. Enjoy! 8.52" x 4.76" and 6.87" x 3.84" and 3.90" x 2.20"
The Request of the Week program is one where you can suggest a design for us to draw and digitize. It's a very popular program, and we are scheduled through 2015 and beyond. However, we still want to read your ideas. Send your suggestions and requests to support@emblibrary.com. We'll add them to the growing list of designs to be created!